A word generally understood to mean the quality or state characterized by profusion or abundance, most often implying superfluous repetition. If we were to see a sign posted which says, "This office will not tolerate redundancy in this office," or "Department of Redundancy Department" we can bet the redundant wording is there to alert people that those who work in that office at least have a sense of humor. 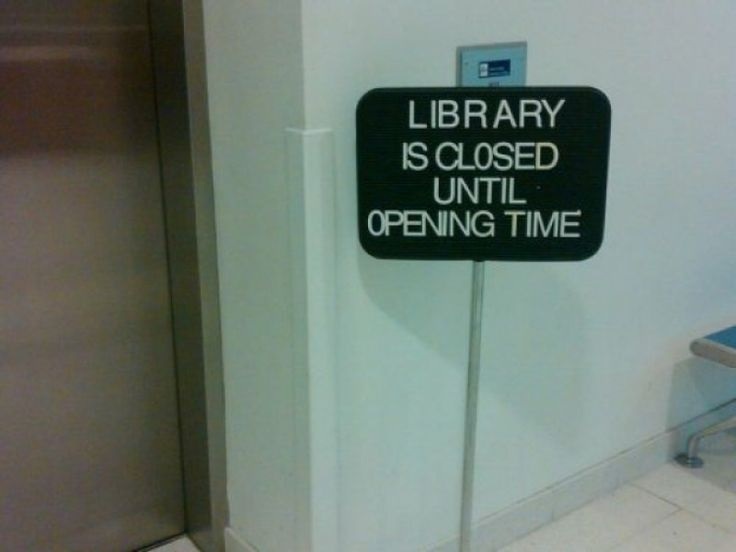 Sometimes however we may come across other signs with redundant wording posted in public places seemingly without any deliberate attempt at humor, such as "Museum of Prehistoric History" or "Library is Closed until Opening Time" (photo). In these cases the redundancy is probably there for a different reason, that being to merely reiterate, and thereby elaborate on, the message being conveyed. Fugue writers down through history, for still another reason, have employed at times during the construction of the expositions of their fugues, something called a "redundant entry." This is an additional entry, usually in the original opening voice, in the alternating tonic-dominant or tonic-subdominant sequence, before the exposition ends. Its purpose, after all the voices have entered once, is to further display the double counterpoint between the last 2 voices to enter; the subject meanwhile is reiterated, usually in the same voice where it first entered, and becomes the redundant entry. For example, let's say we're thinking of taking a stab, for the first time, at writing a fugue exposition with a redundant entry. And let's say this stab of ours makes us think to construct an exposition in 4 voices in this order of entries: soprano, tenor, alto, bass ... S-T-A-B ... Oh No! (groan)... with the ordering of keys being tonic, dominant, tonic, dominant ... or I-V-I-V.
And let's say further, after the subject enters in the bass in the dominant at the 4th entry, that we'd like to see the 1st countersubject follow in the bass (with a return to the home key) so that it might be heard in double counterpoint with the alto line which we'd also like to see carry the 2nd countersubject at the same time; by this means the alto and bass would be given additional (and more equal) participation in the exposition. These additional appearances of the countersubjects in the exposition would necessitate a 5th entry of the subject in an otherwise complete 4 voice exposition. If the exposition is continued in this manner, the subject would be reiterated a 5th time (in the home key) while the alto and bass carry the countersubjects, and it (the 5th entry of the subject) would become the redundant entry ... redundant because the subject enters twice in one of the voices in the exposition. This (5th) redundant entry of the subject could be assigned either to the original voice (soprano) or to the remaining voice (tenor), as these are the only possibilities; since most redundant entries are made in the original voice, we find it assigned here to the soprano and the free voice assigned to the tenor. Any redundant entry like this would be there simply to display some additional aspect of the counterpoint and comes about merely as one more by-product of the exercise of poetic license [See blog, Poetic License]. The score for the D Major Fugue Op. 18 described on this web site is an example of a fugue with a redundant entry [See blog, Getting Started With Writing, Part XIV]. In this example the redundant entry comes right on the heels of the 4th entry of the exposition, remains in the dominant key, and presents the subject and both countersubjects in inverted form. As it so happens, the 5 entries of the subject in the exposition from this example follows this plan: S-T-A-B-(S). The wholehearted answer is, a wholehearted yes.